Your business has several garage doors that need to be opened and closed several times throughout the day, and this can be inconvenient. However, commercial garage door opener controls make it possible to open any garage door or gate on your property from a distance, and this would be very helpful to you. If you need a garage door opener control replacement, you have come to the right place. 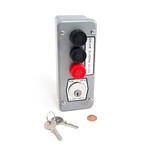 The many control stations that we have for sale on our website are extremely simple to use. 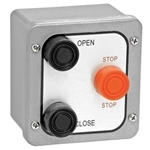 Our most complicated product is the 3BXLT exterior control station with lockout that only has three buttons: open, close and stop. 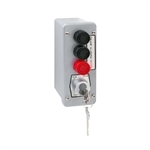 Conversely, our simplest garage door opener control panels have just one button. One example is our 1MHC mushroom head control commercial garage door control. This device only has one large red button, so it would be impossible to mistake it for something else. Some of the commercial control stations that we sell make it possible for you to lock the device with a key when business hours are over. The aforementioned 3BXLT exterior control station is one such product. If you are looking to buy garage door opener accessories, look no further than Star Door Parts.